Visiting pet grooming salon is close to the top of "pet hates" for some dogs. This can be easier to understand if you look at it from your dog's point of view for a moment. Like when visiting the Vets, you are taking your dog to an unfamiliar place. There are strong new smells in the air and strangers that are leaning over him, picking him up, restraining him, and touching him in sensitive places. When you have picked grooming salon for your dog, you need to get him used to the facilities and the staff as soon as possible. If your dog is fearful type, or not keen on being groomed, then he may benefit from a social visit to the pet grooming salon, i.e. before his first grooming session. It is important to get your dog used to being handled and groomed as soon as you get him. Make sure you can touch your dog all over his body, including looking into his ears, touching his tail, nails, etc. You may even want to practice some mock grooming prior to taking your dog to the grooming salon for the first time, i.e. pick your dog up, put him on a table, lean over him, touch him all over as if you were grooming him. These practical tips can help to relax your dog and make him more accommodating during his grooming session. Make sure you exercise your dog properly before his grooming appointment. It will make him tired, both mentally and physically, and hence more relaxed. What's more, exercise increases the natural serotonin levels in the body, which acts as sedative. You and your dog are unlikely to be the only one visiting the pet grooming salon. There are likely to be other dogs, or animals. They may be friendly, or they may not. You don't want your dog to have any unpleasant interaction with other animals so keep your dog on short leash when you arrive. Short leash is best for keeping your dog under control in a busy environment like the pet grooming salon. Our dogs look to us for guidance and are acutely aware of our mental state. So stay calm and upbeat, so your dog get the message from you that there is nothing to be afraid of. You can of course not control how the staff at the grooming salon behaves. However, this is one of the things you should consider prior choosing the salon, i.e. do you agree with how they approach their customers (the dog) and more importantly, will it suit your dog’s temperament. You know your dog best, so you can advise the staff about what kind of behaviour works best for your dog. If your dog is nervous, or does not like grooming, then you may have to work with the staff on the best approach. If they are not willing to work with you, then you may want to take your business elsewhere. 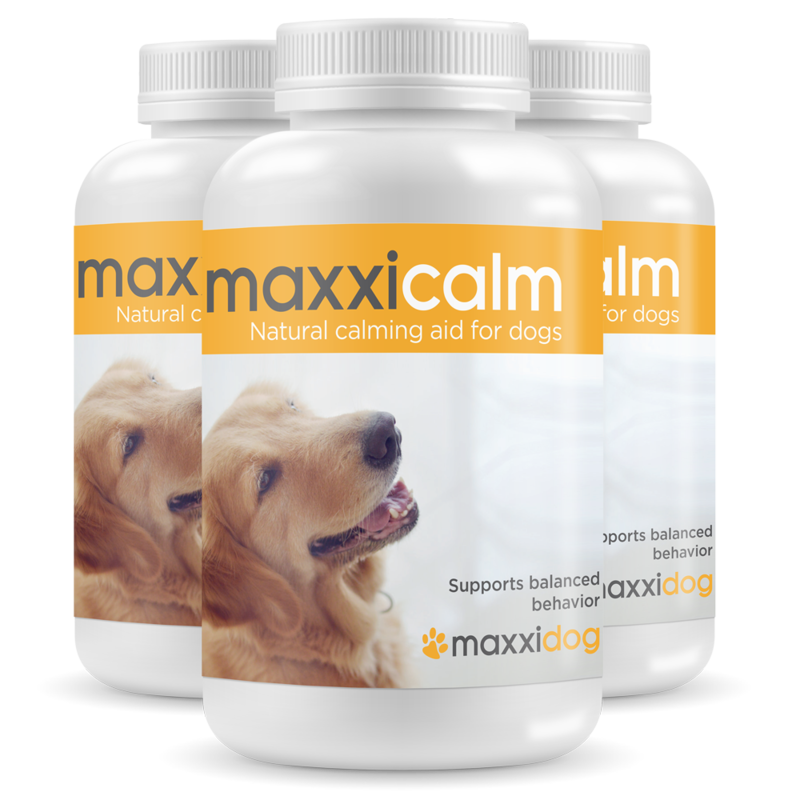 There are available natural calming aids for dogs, like maxxicalm, that can help your dog to relax before his visit to the grooming salon. You should still apply the tips above but good quality calming aid can really take the stress out of the situation for your dog… and for you and your dog's groomer. For best results, you should give your dog the calming aid for couple of weeks prior to his grooming appointment. Dog behaviour techniques, like desensitization and counter-conditioning are the best approach to work with dogs suffering from any fear. However, they are not always practical in real life. They require commitment from both the dog owner and the staff, as well as number of regular visits to the grooming salon. This may though be well worth the effort in the most serious cases, i.e. if you can find a dog groomer that is willing to work with you on this. Don't forget to reward your dog after his grooming session, i.e. to help him associate visiting the pet grooming salon with something pleasurable. It may be a treat, favourite toy, or some activity he really enjoys (though few dog owners like their newly groomed dog to go straight to rolling in the mud). Always take note of your dog's behaviour after his grooming session. He may be bit stressed (normal) but he should not look frightened. This can be difficult to judge but use your cut instinct. If you have any concerns about how your dog is handled, try another grooming salon, or learn to do his grooming yourself in the safety and comfort of your own home.